Lincoln’s Think Tank is the home of business innovation. Since December 2008, we’ve offered businesses of Lincoln the best in high-tech, eco-friendly office space. Since then we’ve opened our own cafe, helped companies grow and been home to some of the most innovative businesses in Lincoln. To find out more about our building and our ethos, please take a look at the pages below, or contact us for more information. Work on the building began in 2007 and just over a year later it became one of Lincoln’s most unique and intelligent office spaces. low-maintenance material that gives the building it’s colour-changing exterior. This hard-wearing crystal effect has become the building’s trademark, displaying a different colour depending on the time of the day. A great deal of thought was put into the design of this eco-friendly building, designed by Marriotts (part of the Kier Group), with impressively modern facilities. The building is hi-tech, energy efficient and cost effective, making it the perfect home for modern businesses. Located on the site used for prototype testing the military tank, it’s located on the Lincoln Science & Innovation Park, which closely reflects it’s links with the University of Lincoln. Internally, much of the concrete superstructure has been left exposed to create a modern ‘industrial’ feel, all natural, with any decoration being eco-friendly too. Shading blinds have been installed on all windows which prevents solar glare and they also create additional heat insulation at night. This unique building has been designed to provide a functional and inspirational working environment, please contact us to book an appointment. 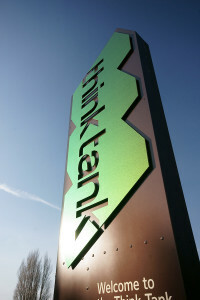 Think Tank is designed by Marks Barfield Architects, creators of the London Eye.